Towa’w: there is room; there is passage; there is time. Hiy-hiy, payukwun: thank you, all one. Veronica Johnny is of Cree, Dene, French and Scottish descent and a member of the Athabasca Chipewyan First Nation. She is a multi-disciplinary arts entrepreneur and life-giver. As a mixed-heritage, two-spirit human being, I bridge worlds in many ways. I’ve been called a mediator, peacekeeper and playful entertainer. As an artist, one of my intentions is to express my truth while exploring the complexities of identity. I do this through music, visual art and storytelling, as Indigenous people have always done. In my experience, art is one of the best ways to create understanding between Indigenous and non-Indigenous people. Like many Indigenous artists, I blend together the traditional and contemporary in my creative work. I form the contrast and the connection. Born in Fort Smith, N.W.T., I grew up self-identifying as Métis, with my mother’s Cree roots having the most influence on me. The rhythm and soft inflections of our language are comforting music to my ears and remind me of the old ways. In my 30s, I became a member of the Athabasca Chipewyan First Nation (Dene) through my father’s lineage. This is one example of a shift in my identity. My journey as a musician began in my 20s. First, I picked up the guitar. Then, I learned to sing and perform as both a solo acoustic singer-songwriter and in cover bands. After meeting my husband, Dave Johnny, we founded The Johnnys — a high-energy rock ’n’ roll band with all-original songs. I’ve made my culture a priority in my life and career. This included working as a Cree language coordinator in my hometown (where I facilitated events including a local powwow), teepee teachings for youth and a comedy show about Elders and traditional stories. A lot of this effort is ultimately about healing, whether through laughter or seeing our people portrayed positively. Around this time, I received my first drum. It was a double-sided shaman drum, made in a traditional way, by the giver’s grandfather. I was gifted with my second drum from an Elder in Vancouver, and later a third, which started my journey as a drum carrier. I didn’t feel worthy of this title at the time, however I recognized that this was not my decision but one made for me by my ancestors. As an artist, one of my intentions is to express my truth while exploring the complexities of identity. In some Indigenous belief systems, drums are considered sacred. For me, they are, and the most significant rhythm pattern is the heartbeat — a slow double beat with a stronger accent on one. People of all backgrounds really respond to this sound. Before we come into this world, the first sound we all hear is our mother’s heartbeat while we grow in her womb. All life shares this memory, connecting us. The drum is like the heartbeat of Mother Earth, and its vibrations are healing. The first drum song I recorded was an honour song for my mother, Tina McNeill. “Ne Mama” (My Mother) includes traditional-style vocables, Cree lyrics and a dedication in English over traditional drumbeats and shaker. The melody accompaniment on piano comes directly from my childhood memories of my mother’s lullaby. The power of the song is how it brings these elements together. There is truly a healing power in music and in art, whether simply enjoying it or making it yourself. It helps people find their voice and express themselves. Music brings us together, in the same way that the calls of birds help them gather in the thousands. I see this often while drumming — people react to the drum without even knowing why. My spirit name is Meadow Valley Woman, which really resonated with me when I translated it into Cree: muskose’wukaw pussa’w iskwao. A meadow, or muskose’wukaw, is where medicine grows, including sweetgrass, my grandmother’s favourite for smudging. A valley, or pussa’w, means it is hollow. While drumming, I was taught to think of myself as a hollow bone, a conduit for song. Drummers during the Athabasca Chipewyan First Nation Treaty Day in 2011. These teachings helped me incorporate traditional culture into my music. 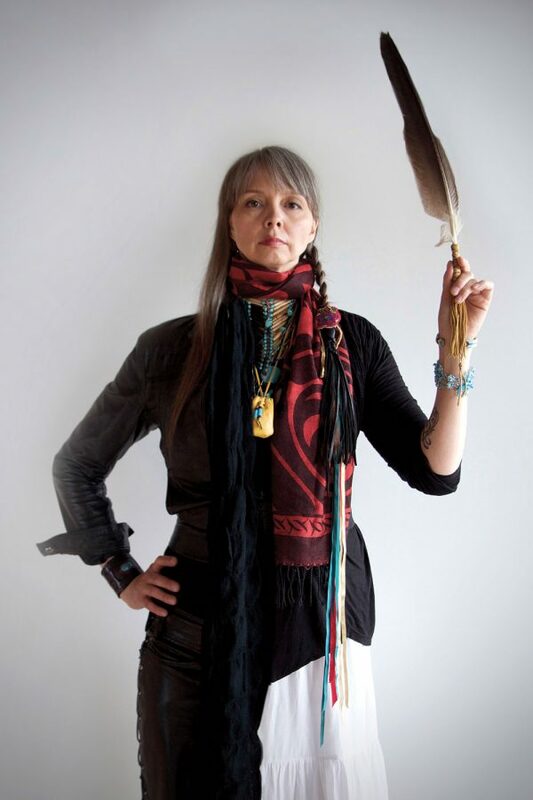 We’ve focused on issues like smudging and ceremony, celebrating Mother Earth, matriarchal power and missing and murdered Indigenous women, following a proud tradition of other Indigenous trailblazers. As artists and musicians, we have more influence than politicians and lawyers to change society for the better because we have the power to express ideas that make others feel something. Ultimately, creating change comes down to reaching people’s hearts, not their minds. For me, embracing traditional culture, while surviving and thriving in the contemporary world, is key. As a two-spirit person, and as both a hand drummer and rock singer, this really resonates with me in celebrating different sides of myself. Artists who have blended traditional teachings with contemporary messages constantly inspire me. Buffy Sainte-Marie has been a powerful influence on my work. Link Wray, Redbone and Jesse Ed Davis helped illustrate the diversity of our Indigenous nations in the ’70s. Today, artists and musicians I respect like Jackie Traverse and Pura Fé motivate and inspire me. In the Northwest Territories, many women drummers face criticism from community members who believe that women should not drum. I was relieved to discover that several prominent female hand drummers in my family tree had been accepted as drum carriers. This helped me withstand the negativity, while also informing some of my songs about female empowerment. 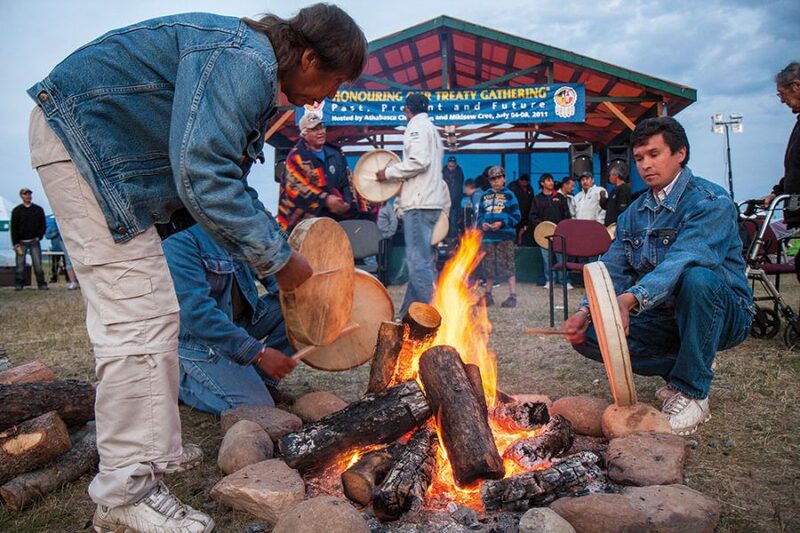 As Indigenous Peoples, we have to constantly challenge assumptions and break new trails. I’ve had to confront this many times in my own career, working in several male-dominated industries. I am continually inspired by and grateful for the leaders who have come before me, allowing me to be where I am today. My hope is that our people go even further in the future. We come from a long line of strong and resilient human beings who have lived through more than we’ll ever know, but have stood proudly since time immemorial.